I need help. Your help. Somebody's help. I am oppressed. Under a heavy burden. Well, not that heavy. But oppressive, yes. And all in the form of one of my favourite authors. Milan Kundera. It is of course not his fault. But his book of essays, Les Testaments trahis, is weighing heavily on me. Killing my spirit. Softly but surely. I can't finish it. I'm halfway through and now I'm blocked. I can't let it go. But I can't carry on. You may recall that I started it back in May. With great gusto and enthusiasm, I might add. But maybe my tired brain is not up to this intellectual challenge. His undulating and mesmerising thought processes. And so I put it back on the shelf. Away from sight. And it's been hanging over me ever since. I can't throw it aside never to read again. Although deep down in the darkest recesses of my being that's what I'd like to do. If I'm honest. Between me and you. But I seem incapable. 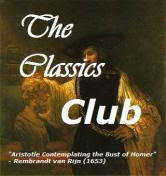 And so, MK and his Testaments trahis remain on my Classics Club challenge list. Until I can be brave enough to remove them. If ever I can. Help me. Any advice would be welcome. Please...?